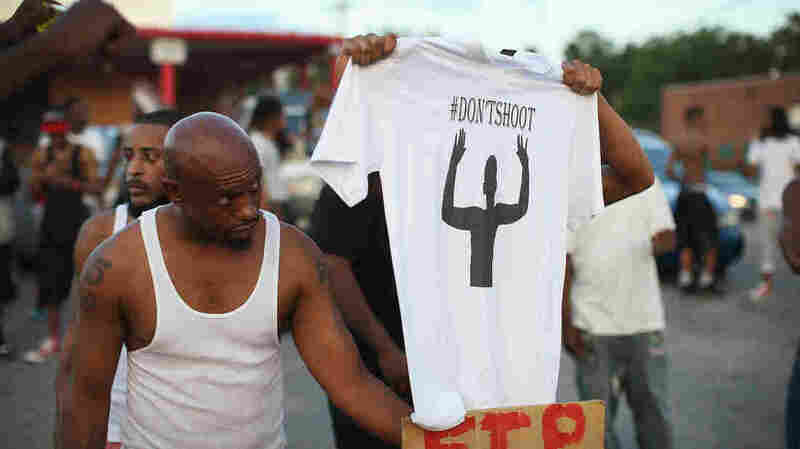 In Ferguson, Missouri, Calls For Justice And Calm After Michael Brown's Death : The Two-Way Citing safety concerns, police in the St. Louis suburb where police shot and killed an unarmed black teenager Saturday say they won't release the name of the officer who fired the shots. Demonstrators protest the killing of Michael Brown, 18, who was shot and killed by police Saturday in Ferguson, Mo. Citing safety concerns, police in Ferguson, the St. Louis suburb where an officer shot and killed an unarmed black teenager Saturday, say they won't release the name of the officer who fired the shots. The department reportedly received threats against the officer. "If we come out and say, 'it was this officer,' then he immediately becomes a target," Ferguson Police Chief Tom Jackson said, according to the AP. "We're taking the threats seriously." The killing of Michael Brown, 18, has sparked three days of protests and rallies that have included clashes with police and looting, along with prayers and calls for justice for the recent high school graduate and his family. Brown's death is being investigated by St. Louis County police; the FBI has opened its own separate inquiry. The decision not to release the officer's name publicly was made by Ferguson police, meaning that "Mike Brown's family attorney would have to go to court to compel release of officer's name," according to local TV news Fox 2 Now. Brown's family is now being represented by Benjamin Crump, who previously worked with the family of slain Florida teenager Trayvon Martin. Crump tells Fox 2 Now that they'll seek to force the department to reveal the officer's name. The case revolves around an altercation that involved Brown, the officer and a third person. Police say the incident reportedly included a struggle over a gun in the officer's police vehicle, where at least one shot was fired; some witnesses say they don't agree with the official account. In the end, Brown died in the street after being shot multiple times. A young man who says he was with Brown before and during the confrontation says that as of Tuesday, police still had not spoken to him. Dorian Johnson, 22, says he and Brown had been walking in the street when the officer ordered them to get onto the sidewalk. "After telling the officer that they were almost at their destination, Johnson's house, the two continued walking," MSNBC reports. "But as they did, Johnson says, the officer slammed his brakes and threw his truck in reverse, nearly hitting them." Things quickly escalated, Johnson says, with Brown and the officer engaging in a "tug of war" that didn't end until Brown was shot. Johnson says he and Brown then ran — and that the officer shot Brown several more times. Johnson's attorney, former St. Louis mayor Freeman Bosley, tells MSNBC that police declined his offer of letting them speak to him. "I know the events of the past few days have prompted strong passions, but as details unfold, I urge everyone in Ferguson, Missouri, and across the country, to remember this young man through reflection and understanding. We should comfort each other and talk with one another in a way that heals, not in a way that wounds." The Rev. Al Sharpton will visit Brown's family in Ferguson on Tuesday morning and hold a news conference around midday. Sharpton spoke with family members last night on his MSNBC TV show, Politics Nation. Brown's mother, Lesley McSpadden, and grandfather, Les McSpadden, spoke out against the violence that has followed emotional protests in Ferguson. Lesley McSpadden told Sharpton, "I should be celebrating — we all should be celebrating my son's graduation and going on to college. But we're planning a funeral." 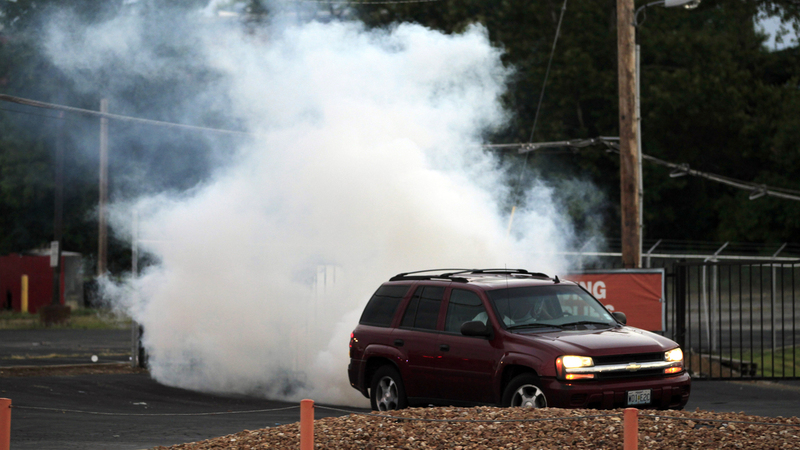 A car pulls away as tear gas is deployed by police in Ferguson, Mo., Monday, in an effort to quell unrest and looting in the wake of the death of teenager Michael Brown. Some schools in the community postponed their first day of the academic year from Monday to Tuesday, citing "unsafe conditions" in the wake of the killing and protests against it, according to St. Louis Public Radio. In Hazelwood School District, where classes began as planned Monday, Superintendent Grayling Tobias said, "I want to reassure our community that we are listening to our students and allowing them to express their thoughts as needed." He added that the school's staff would "be there for our students if they need to process the information. What that means is listening, being highly visible, being highly vigilant, making sure that we are there for our students as they sort out their feelings related to this situation." The Ferguson community is a town of some 21,205 people — about two-thirds black and one-third white, according to census data highlighted by St. Louis Public Radio. The median household income is about $37,500. In a tweet, St. Louis Alderman Antonio French adds that the town has "a white mayor and mostly white city council. 53 police officers. Only 3 black (2 female, 1 male)."